We like to send out a monthly eNewlsetter that highlights our current projects for folks considering different types of outdoor retreats to look at and draw inspiration from. The following landscaping project took place in Yorktown and involved very little major construction or financing to complete and wasn’t in our eNewlsetter. However, landscaping is not always about a major bed renovation or hardscape installation and we wanted to give an excellent example of how a few minor changes can make a big impact in landscaping! Moving on with the show to our lovely landscaping project taking place right here in Yorktown; lets talk about updating a pre-existing bed. Our Design Team received a call from a homeowner who had a lovely pre-existing bed that merely needed a few modifications. The existing plants were under-size for their placement and the scale of the house. Larger more appropriately-sized plant material was installed for balance. 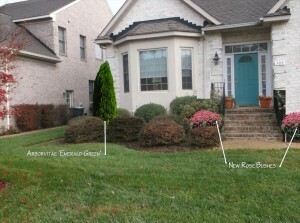 Two Sky Pencil Hollies and one Spirea were removed and replaced with Arborvitea ‘Emerald Green’ Hoogendorn Holly. An overgrown taller variety of roses in front of the porch were removed and a colorful moderate-sized Knock-Out Rose was installed. These simple alterations accomplished balance and symmetry with a more pleasing appearance. This project proved minor changes can make a large impact to your pre-existing beds and not wreck havoc on your budget! Take a look at the before and after shots at the end of the article. Landscaping in Yorktown occasionally involves compliance with a regulatory agency such as the Chesapeake Bay Protection Act under Resource Protection Areas. Check back for more projects that involve design and compliance with those regulations. Non-compliance can result in heavy fines and having to excavate the entire project. Don’t let this happen to you! 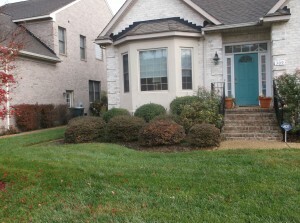 If you live on the water and need landscaping in Yorktown, call the Design Team. We have completed numerous projects involving compliance with such regs. If you live in York County, check out this map that outlines the protection areas and resource management areas to see where you are in relation. By the way, if you want to sign up to receive the newsletter, we would love to put you on the list. You can receive helpful tips that are common concerns for Peninsula Residents and other interesting gardening facts.